Sorry there is no photo to go with this story but I’ve got to tell………yesterday at dusk I decided to walk to the bird hide just after finishing my watering chores. Nothing visible on the ponds so I walked down on to the bund wall, I heard a Red-necked Crake cackling so I walked quietly towards the direction of the call. In the shallow stream below the spillway I saw a bird with dark wings splashing in the water so I dropped into a squat and stayed still as it was coming towards me. In the rapidly fading light I was able to see the markings around the bill and the breast clearly enough to realize that I was watching a Black Bittern having a bath. After several seconds it became aware of my presence and froze as I had – finally my knees insisted that I stand. Still no movement from the Bittern and by then it was nearly dark and I couldn’t see it any longer although I was aware of a ripple on the water as I moved away. The poor bird was probably getting wrinkly toes waiting for me to go. As I walked down to the hide this morning several of the Magpie goose ‘scouts’ in the trees gave alarm calls which isn’t unusual but as I sat down I heard a distant and consistent ‘peeping’. On close inspection through binoculars I could pick out a number of goslings with adult geese on Rupert’s pond and I was soon able to see the ten goslings quite clearly as they moved out of the vegetation and onto the water, closely attended by a gander and two females. It is not the first time Magpie Geese have bred at Wild Wings but they were not successful last year so it is very pleasing to see the expanded family on the water. Later in the day the goslings were escorted by a number of adults through thick vegetation into Graham’s Pond on which the hide is situated and so finally we were close enough for some reasonable photos later in the afternoon. 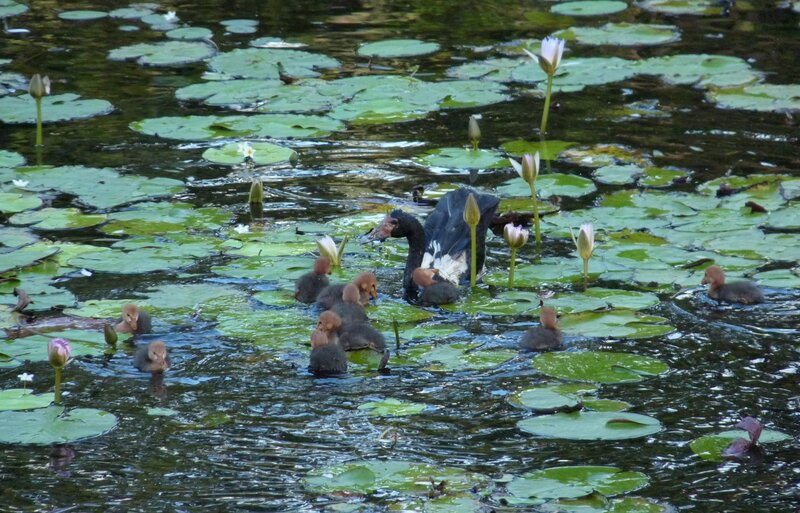 One of the adult females appeared to be feeding parts of the water lily flower to the goslings. She was diving for the spent flowers under water which we imagine would have started to form seed and so have a higher protein content. And no we didn’t get a lot of work done today – we made the most of a special experience and we are very happy and content. This entry was posted in Bird Observations, Pond Life and tagged Black Bittern, Magpie Geese and goslings. Bookmark the permalink. Great stories such as yours about the Bittern don’t need pictures! The goslings are so cute. Hope the geese manage to raise all or most of them! Just delightful. It’s completely understandable why ‘work’ was put on hold. Thank you Duncan, Mick and Gouldiae for your comments. I’m glad that you all enjoyed the posting. Yesterday morning the Goose family appeared to be content feeding in one of the ponds but by lunchtime we couldn’t find them and haven’t sighted them since although there are still about 20 adult Magpie Geese in residence. 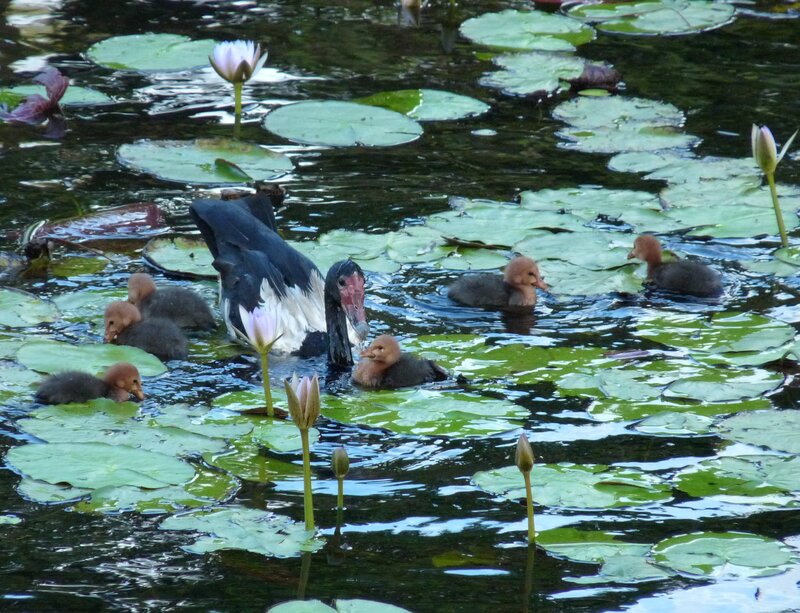 In a previous year the Goose family behaved in a similar manner and was subsequently spotted in the Daintree river. Apparently moving the goslings is not uncommon behaviour so we are glad we spent the time watching them while they were here. 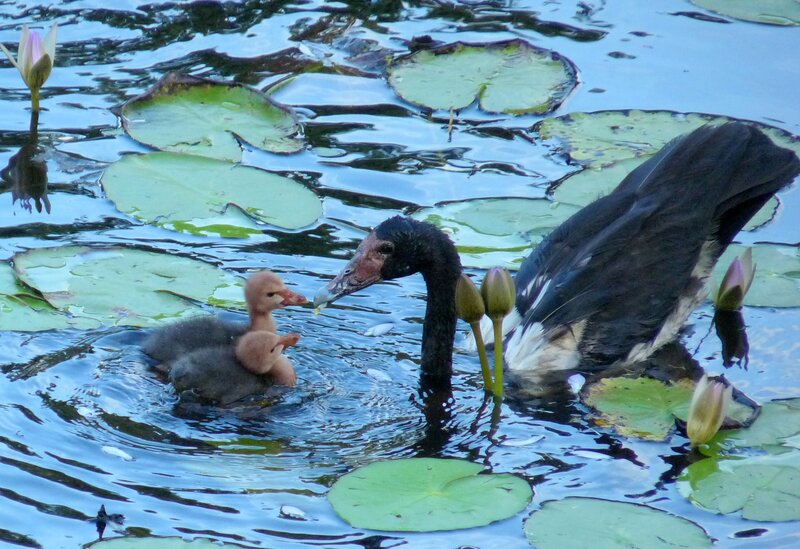 Great stories – and wonderful images of the Goslings. Thanks Denis, its fun sharing the stories. Good yarn Barbara. It seems that we bloggers tend to only post when we have a photo which is a shame really. Thanks Lorraine, I’m sorry to be so tardy in my response. A good photo or two do make the story come alive but its just not always possible.